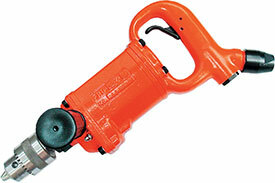 Fuji Grip Handle Medium Size Drills are light weight with a sturdy construction. Their practical design represents Fuji's latest developments in drills technology. Fuji offers a complete line of drills with a drilling capacity range from 2 mm to 100 mm. The 5412053262 Fuji NPT FRD-16Z-1 Grip Handle Medium Size Drill is one of thousands of quality tooling products available from MRO Tools. Please browse Fuji Grip Handle Medium Size Drills for tools similar to the 5412053262 Fuji NPT FRD-16Z-1 Grip Handle Medium Size Drill. 5412053262 Fuji NPT FRD-16Z-1 Grip Handle Medium Size Drill description summary: Model: FRD-16Z-1C N Trigger: Inside Trigger Drilling Capacity: 16mm/ 5/8'' Stall Torque: 34.3(N.m)/ 25.3(ft.lb) Free Speed: 800min-¹ Spindle Type & Size: 5/8-16UNF Chuck Capacity: 16mm Side to Center: 34mm/ 1 11/32'' Power: 660(W)/ 0.88(hp) Quantity discounts may be available for the 5412053262 Fuji NPT FRD-16Z-1 Grip Handle Medium Size Drill. Please contact MRO Tools for details.